Nearly 10,000 people turn 65 every day in America. At the 2015 Conference on Aging at the White House last week, President Obama highlighted the contributions and the challenges of an aging American population. The event, which has been held every ten years since the 1960s, brought together government officials, members of the public, business leaders, and community leaders to discuss ways to improve the quality of life of older Americans. It was preceded by five regional forums that delved into the key issues affecting older Americans. The goal: to embrace the transformative demographic shift that is occurring in this country and to recognize the possibilities of healthy aging. Westchester Library System’s instructional arts program for aging adults leverages the benefits of social engagement and creative expression for healthy aging through partnerships between libraries and arts and community organizations. Some of the conference themes were healthy aging, independent living, financial security, and community involvement—issues well known to many museums and libraries. IMLS investments have supported model projects to serve seniors, many with tools and resources that can be used by other institutions. I wanted to share a few examples that could help inform your work with this growing population. The Athens-Clarke County Library, in Georgia, used an IMLS grant to partner with Lyndon House Arts Center on The Boomers: Reflecting, Sharing, and Learning to develop programming for and by the baby boomer population. The project provided seniors with tools to create learning experiences for themselves and their community with live webcasts, which were archived online. Take a look at their best practices manual [PDF], a roadmap for developing similar public programs at your institution. The Goldstein Museum of Design in the College of Design at the University of Minnesota used an IMLS grant to explore independent living for seniors through an exhibition and a 30-minute program that was broadcast on Twin Cities Public Television. The exhibition, “Smart House, Livable Community, Your Future,” explored innovative designs for housing technology, adaptive home technologies, and community design. The museum held 59 public programs to complement the exhibition. 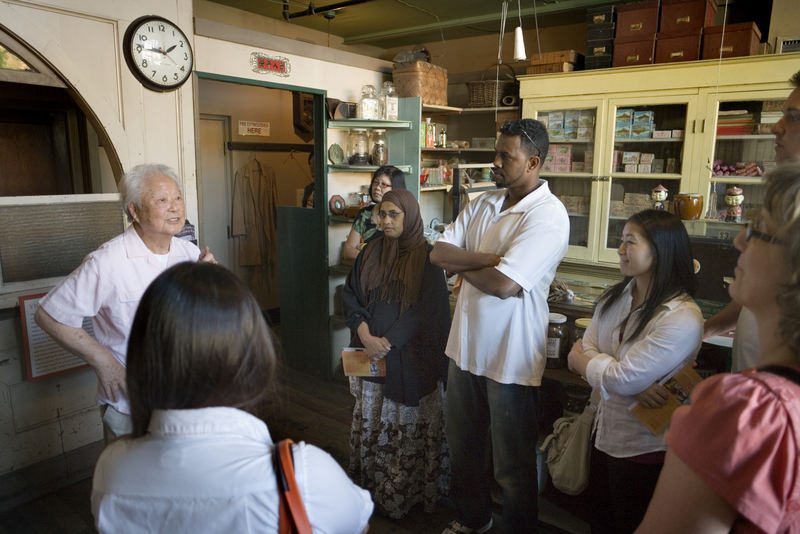 Community leader Jimmy Mar gives a tour of his family’s Yick Fung Store opened in 1910 and now an immersive exhibit at The Wing. Photo by Olson Kundig Architects. The California State Library’s Transforming Life after 50 project (TLA50) positions libraries as cornerstone institutions for productive aging. All the training presentations, tools, and program models from this initiative, including the promising practices created by the funded libraries and the IMLS Fellowship courses, as well as a searchable resource database – are available on the project website. The Morikami Museum and Japanese Gardens in Delray Beach, Florida, collaborated with a local college of nursing to create a unique program that targets seniors over 65 who are dealing with depression. The partners conducted a study on the efficacy of garden walks and guided imagery walks to improve seniors' mental health and overall well-being. The project’s online manual outlines the study findings and describes the elements for public programs [PDF] that help alleviate depression for seniors. Libraries and museums are committed to providing opportunities for seniors to share their expertise through special public programs, reading groups, volunteering and mentoring. They have an important role to play in the health and well-being of this growing demographic. Please share with us how your institution serves the seniors in your community.